Jon Kopaloff/FilmMagicNot long ago, Adele was spotted out and about with famous friends like Jennifer Lawrence in New York City. Now, she’s hanging with equally famous folks back home in London. Photos have popped up on social media of the singer hanging out backstage at London’s O2 Arena Sunday night with Michelle Obama and RuPaul. Yes, that happened. According to Gay Star News, Obama appeared at the venue to do a Q&A session with Stephen Colbert in order to promote her autobiography Becoming. Ru and Adele were among the 15,000 people who attended the event. According to the website, RuPaul is in London filming Drag Race UK, and Adele’s BFF, TV host Alan Carr, is one of the judges. 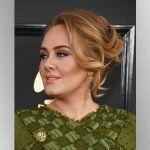 There’s now speculation that Adele will be a guest judge on one of the show’s episodes.